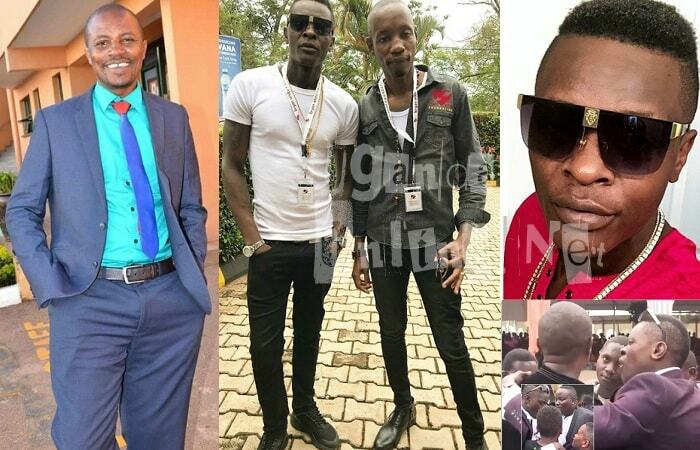 Bukedde TV's Gossip President, Josephat Sseguya, has dragged star singer Jose Chameleone to police following the Friday fight at Catherine Kusasira's introduction ceremony. Sseguya now fears for his life and has taken up the matter with the authorities. "I made Chameleone what he is, but he beat me up saying that I'm the one responsible for his low rankings in his music." It all happened in Luweereo during Catherine Kusasira's intro.."These are kicks of a dying horse. Chameleone was looking for ways of making news, and indeed, he made it, but on the contrary, it should be music doing the talking for him," Seguya added. Many have come out telling off Chameleone that whatever was done during Catherine Kusasira's intro was unacceptable...It later turned out that Chameleone fell soiling his trouser in the process and as a way of stealing the show like the Chameleone he is, he resorted to throwing money to the guests which led to a stampede as many fought to get some of the notes that were flying all over. While responding to the beating allegations, Chameleone said that he did not beat him as he is putting it. When my wife gave birth from America, he talked, when my wife left home, he still talked, but now that you've decided to go to court, it's fine. Bryan White advised them not to involve court, they should instead settle their differences. "Sseguya, I will be looking for you so that we solve these issues man to man and not in court as you are planning" Bryan White noted.